Smooth, rich formula enriched with Vitamin E. Great for trade shows, conferences and other events where hand shaking and introductions regularly take place. Be sure you and your company make a great first impression with these 'scentsational' promo hand and body lotions. 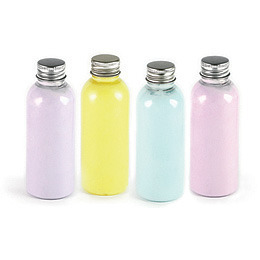 Transparent, recyclable 125ml PET bottle with stylish aluminium cap. Fragrances/Colours: lavender (purple), banana (yellow), peach and chamomile (orange), lime (green), orange (orange), rose (pink), macadamia (white), peppermint (blue), unisex fragrance free (white).